Anjou pears are a medium-sized variety, with a slightly egg-shaped appearance. The green-skinned pears have a short, squat body and almost no neck typical of a pear. The bright green skin is often blushed with a rose flush on the side most exposed to the sun while on the tree. The flesh of the Anjou pear is bright, white and dense with a slightly sweet flavor with subtle notes of citrus. Anjou pears are very juicy when ripe. 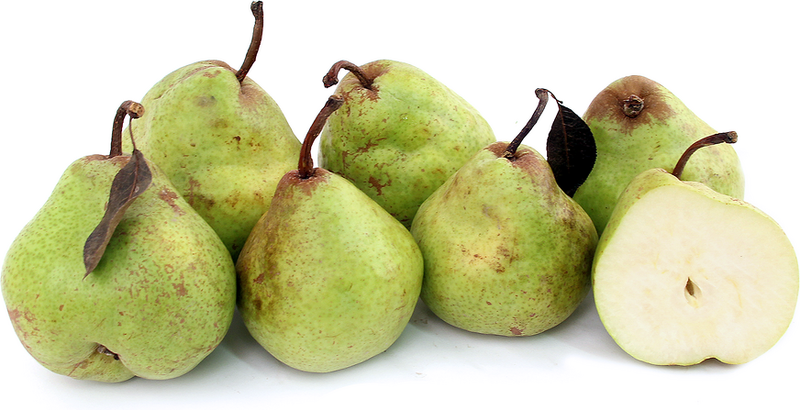 Anjou pears remain green when ripe, with only a slight change in their bright green-colored skin. Press gently against the stem end of the fruit to test for ripeness. Anjou pears ripen from the inside out; if the flesh gives slightly, the pear is ready to eat. Anjou pears are available year-round. Recipes that include Green Anjou Pears. One is easiest, three is harder.